Most people consider it as a joke, but it is in fact a religious festival held in Kanayama Shrine in Kawasaki, Japan. Kanayama Shrine is where the Kanamara Matsuri festival or Phallus festival transpire annually on the first of April. The festival is dedicated to both the legends of the divine couple, Kanayama Hiko no Kami and Kanayama Hime no Kami, and of the Steel Phallus. According to myths, Kanayama Hiko no Kami and Kanayama Hime no Kami were both gods of mining and blacksmiths. They were known to have healed Izanami no Mikoto’s (Shinto goddess) lower-half-body injuries to which she acquired after giving birth to her child. From then on, Kanayama Shrine became a temple for those who pray for fertility, matrimonial harmony, safe child-deliberation and sexually transmitted diseases. Another legend involves a demon who’s inloved with a woman who didn’t love him back. As a revenge, the demon entered into the woman’s genitalia, giving him the opportunity to bit off the two husbands’ genitalia while making love on their wedding night. She then went to a blacksmith who made a steel phallus leading them to defeat the demon after breaking his teeth on his attempt to bite the genitalia. Since then, it had been a tradition to celebrate the festival in honor of the both legends. 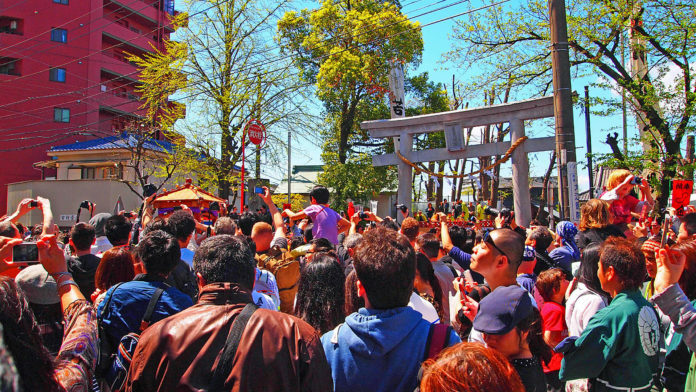 On the day of Kanamara Matsuri, Japanese engage themselves into a traditional procession where three phallic mikoshi or portable shrine made their appearance while rounding down the streets of Kawasaki. After the procession, there are stalls and vendors who sell phallic-shaped treats such as candies, lollipops, vegetables, street foods, and also toys. There are also phallic-themed activities that will keep you busy while whether carving a phallus out of radishes or woods, taking photos on different phallus effigies and many more. While the festival may look quite blatant and ridiculous, it is in fact one of the warmest festivals which welcomes all genders and orientations. Upon celebrating the event, the festival is at the same time raising a money for a charitable cause of donating it to LGBTQ community and HIV and AIDS research centers. I would love to know the backstory of this wonderfully-dressed person who preceded the Kanamara Matsuri parade on a rickshaw, but I haven't found any information. And though it has received a lot of criticisms and speculations, one thing is for sure —that the festival is devoted to a significant purpose of celebrating good health, prosperity, fertility and the community’s harmony.